The Atascadero Police Department has released the identities of the officer who fired a shot and the suspect who was wounded in a July 4 altercation. The officer is on administrative leave pending the results of an investigation into the shooting, and the suspect is in stable condition at Sierra Vista Regional Medical Center. On Monday, Sgt. Gregg Meyer fired a single shot from his handgun, striking Gary Roger Reynolds, 59, in the stomach, according to the police department. Meyer fired the shot as Reynolds was approaching a group of officers while holding a metal bar. Police shot less lethal munitions, which did not deter Reynolds, prior to Meyer firing his handgun. The shooting occurred after Reynolds rammed his truck into a vacant building on El Camino Real. At around 1:05 p.m., Reynolds drove through the roll-up door of the structure and continued driving into the back of the building. He then reversed out of the building and into the adjacent parking lot across the street. Reynolds struck a vehicle while driving in reverse. Reynolds then drove back across El Camino Real and into the building again. When he backed out of the building again, his truck became lodged in debris. Reynolds exited the truck armed with the metal bar. Officers had arrived on scene, and Reynolds started approaching them. After Meyer shot Reynolds, officers subdued the suspect and called for medical attention. Reynolds underwent surgery at the hospital. None of the officers involved in the incident suffered injuries. Atascadero police and the San Luis Obispo County District Attorney’s Office are currently investigating the shooting. Police are still requesting that witnesses of the shooting come forward. Meyer, a 20-year law enforcement veteran, has been with the Atascadero Police Department for 10 years. He previously served with the Los Angeles and Covina police departments. 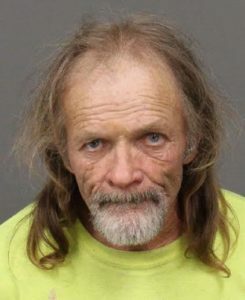 Reynolds, who is listed as a San Luis Obispo County resident, is charged with assault with a deadly weapon likely to produce great bodily injury on a police officer, according to the sheriff’s office website. He also faces charges of vandalism and exhibiting a deadly weapon other than a firearm. Officers technically booked Reynolds in to the San Luis Obispo County Jail on Monday. Police will transport him to jail when he is released from the hospital. Reynolds’ bail is set at $50,000. Too bad Gary isn’t a black man, then Atascadero would have made national news! Thank you officers for using non lethal means first, and then firing a single shot. Excellent restraint. I’m sorry Officer Meyer, that you have to suffer through the stress and grief of having to shoot a human being. I hope you get the needed support to recover from this traumatic experience.